No longer produced, the TP93,(known in 1992 as the MP90), may still be available in some areas. 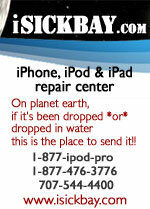 It was designed in the United States by John Mavr. The pedal body was assembled and largely manufactured in the US. 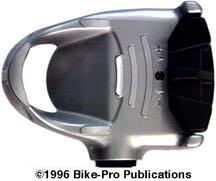 The pedal was cast of aluminum alloy in the Chicago area. The interior of the body was tapped for the spindle and bearing cartridge to screw into, painted Grey with the top milled away leaving three silver raised radius ridges. The body has a large angled chute and an open toe to permit mud to break up and drop away. The spindle and bearing system is made as a complete unit in Japan by Shimano for this pedal set. This review of MP90 pedals is for historical purposes only, they are no longer made. 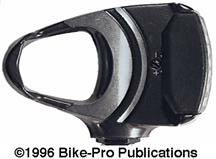 After John Mavr designed the TP93 mountain bike pedals based on what he noticed mountain riders in the United States appeared to require, his ideas were brought to France where they were modified slightly and reintroduced in 1992 as the MP90 Pro Elite. 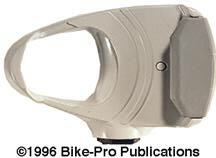 In the 1993 season they were called the MP90. The body is cast of aluminum alloy with the mud evacuation hole somewhat smaller, and the chute tilts away from the pedal at a steeper angle. The open toe still exists at about the same size. The entire body is painted a glossy Silver color, then the pedal is flipped over in a masking stand and painted with a glossy metallic Grey paint finish on the bottom half. The top of the pedal and the top of the toe are then milled leaving exposed Silver accents. 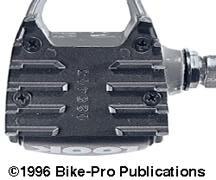 The MP90 pedals use the same spindle and bearings that all the LOOK pedals have and is described above in the overview. The bottom of the pedal has a plastic plate approximating the aluminum one on the TP93, but with no milled silver accents. This plate forms a tread for use when not riding clipless, which recesses the cleats into the plate. The plate is fastened with three recessed pan head machine screws. 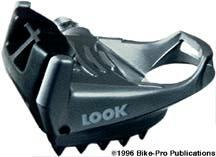 The release mechanism operates the same as the other LOOK pedals and has the tension adjustment screw on the top. The spring tension adjustment screw will vary the release tension between 1.1 and 1.6 Kilogram-meters or the equivalent of between 7.9563 and 11.5728 foot- pounds. 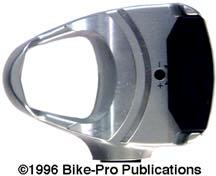 The locking retaining lever has two holes flush with the pedal surface permitting dirt and mud to exit from the rear. 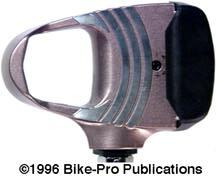 The rear lever is made of Black Delrin plastic and the cast aluminum body is painted in a Silver and dark Grey with milled Silver accents on top. 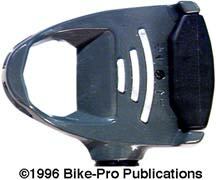 The MP90 pedals weigh 486 grams per pair without cleats. The Black mountain cleats with mounting hardware weigh 46 grams per pair and the Red cleats with mounting hardware weigh 44 grams per pair.